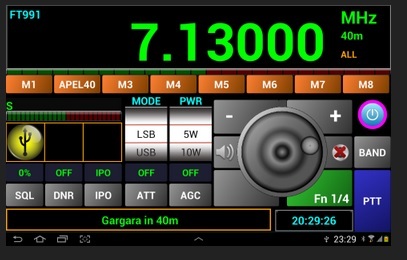 REAST member Vince Henderson VK7VH has written in with this excellent article on how he is using Pocket RxTx, an Android application, to remote control his Ts-2000 Radio. A couple of years ago, I looked at the remote radio control Android app, called Pocket RxTx. It had many teething problems. I left it alone until it showed signs of being reliable. TS2000 – CAT connection from radio rear com connector to PC RS-232 serial port. This is a straight type cable. Audio in/out and PTT is via an interface that connects to the 13 pin ACC2 port on the back of the radio. PTT via pin 9 PKS and pin 8 GND, mutes the front mic. Audio in (from interface) via pin 11 PKD and pin 12 GND. Audio out (to interface) via pin 3 MANO and pin 4 GND. The Pocket RxTx website lists the radios that have been tested with the app. You will probably find your make and model of radio, in the list.